The toilet paper plant! That was probably my earliest memory of Thimbleberry. Long before the appreciation of its jammy fruit punch flavored berry it was the go-to plant for when I found myself in a ‘number 2’ camping pinch. Still as the years progress I continue to be surprised by the practical versatility of this widespread shrub. 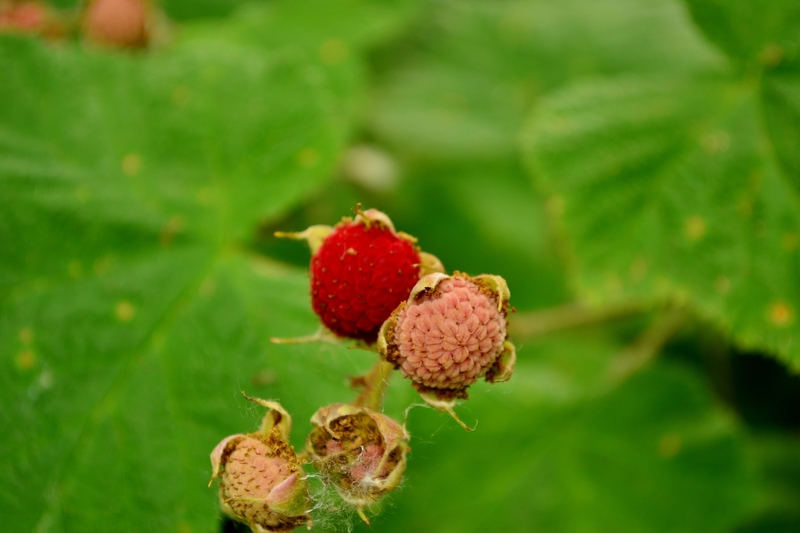 Thimbleberry’s real name is Rubus parviflorus. It is in the Rosaceae (Rose) family and is in the same genus (Rubus) as raspberry, blackberry, loganberry, boysenberry, tayberry, dewberry and many others. Rubus fruit are an aggregate fruit composed of small, individual drupes, each individual is termed a drupelet. In a sense they are many little berries grouped together to make one large berry. 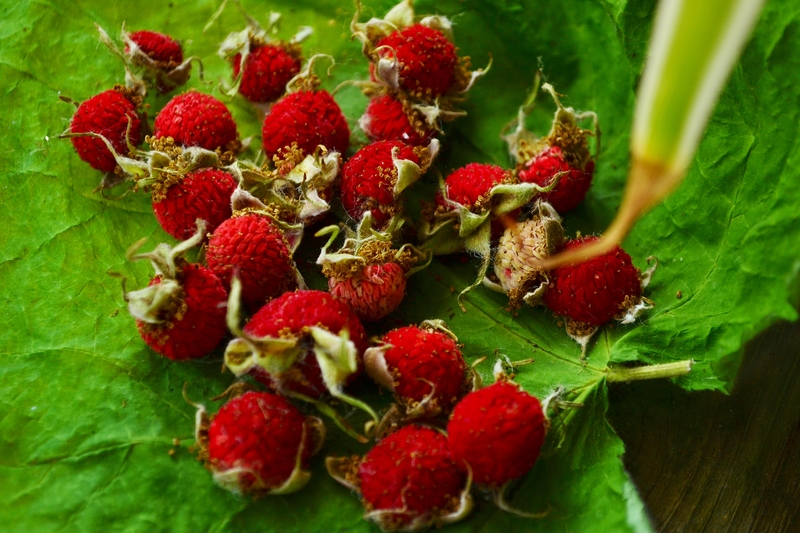 Like many of the other Pacific Northwest berries, Thimbleberry was eaten by the Native Americans. The Nuu-chah-nulth (New·chan·lulth) were known to collect the young shoots to be eaten raw as a vegetable and the berries were dried smoked with clams. The Kwakwaka’wakw (Kwak·wak·ya·wak) harvested the berries while they were still pink and hard, then stored them in cedar bags until ripe. The broad soft leaves can be used to make a quick pouch for holding the berries and provide a practical solution to assist you during your bathroom duties. Thimbleberry is both low in fat and calories and is a great source of vitamins A and C with traces of Potassium, Calcium and Iron. The premature berries of Rubus parviflorus. The young shoots, roots and leaves have been used to treat many ailments. A tea is made of the leaves or roots as a blood tonic in the treatment of nausea, vomiting, diarrhea and dysentery. Its effects are believed to tone and strengthen the stomach helping increase appetite. 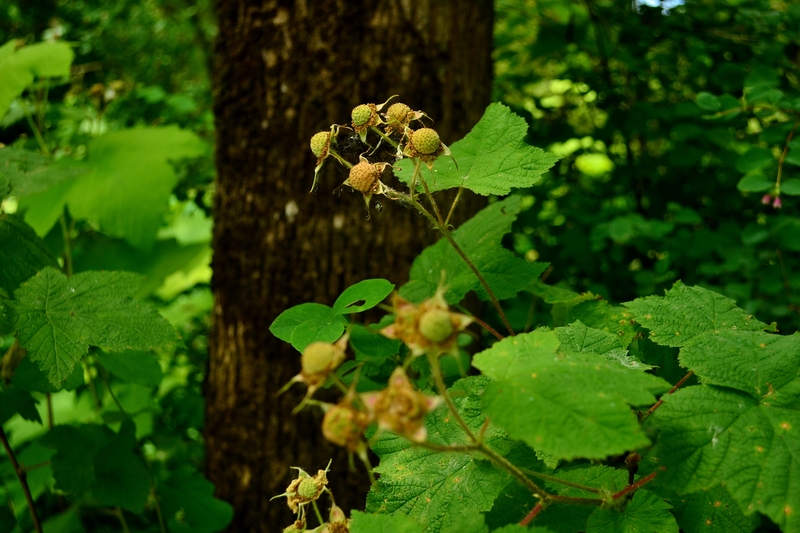 Rich in vitamin C, Thimbleberry helps boost your immune system and was used to ward off scurvy. A poultice of the dried powdered leaves treats wounds and burns and the fresh leaves can be crushed and applied to treat acne. A decoction of the roots has also been taken to treat acne. Thimbleberry can be recognized by its broad fuzzy-soft leaves. You can find Thimbleberry as a great berry substitute for your favorite dessert dishes. Sprinkle a handful on some vanilla ice cream or mix a few with your pancake batter. They are tasty in cakes, breads, muffins, pies, jams, wines, salads, dressings, the list goes on. Its all up to your imagination. So next time you find yourself about to prepare a berry dish, give this humble little Rubus a try! Down below is a list of Thimbleberry recipes you may find enjoyable. Seasoned Halibut wrapped in Thimbleberry leaves. Erect, thornless 1.5 – 6 ft tall, forming dense thickets from rhizomes. New growth soft with hairs maturing to bark by next year. 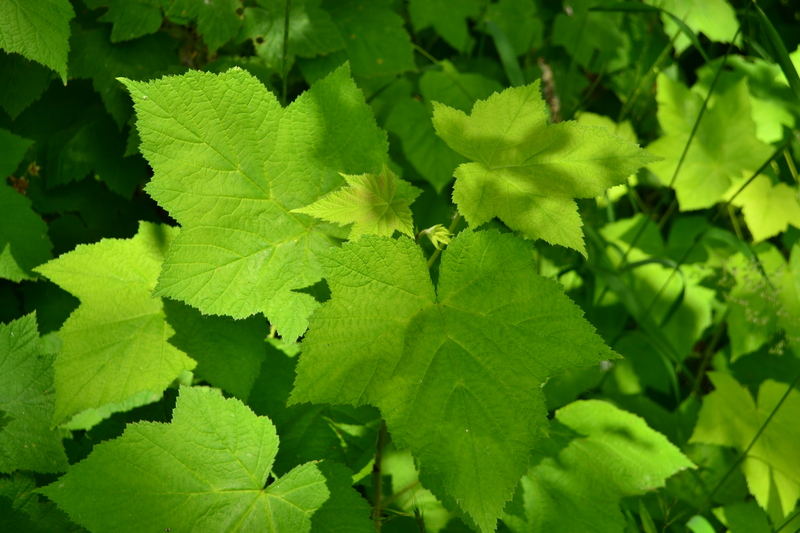 Alternate, deciduous, large (up to 10in across) fuzzy soft maple shaped leaves. Flowers white (up to 1.5in across) 5 delicate petals resembling a wild rose in shape. Many (3 – 11) borne in clusters on long stemmed terminal. Fruits are raspberry like clusters of red opaque hairy drupes. Juicy, seedy, from a tangy to sweet punch flavor. Open sites (forest edge, clear cuts, country roadsides, shorelines) or open forest. Low to subalpine elevations. Young shoots in late spring while still soft and tender. Berries in early summer, for large gatherings pick while still hard and pink, then ripen in storage (usually 1 – 3 days) Healthy leaves and roots for medicinal purposes. Awesome info and photos. I’m interested in using one of your photos for an upcoming (non-profit, educational) project, with appropriate credit, of course. It’s hard to find good photos of thimbleberry shoots! Can you contact me? With appropriate credit, please feel free to use it. I am happy to hear that my work can help promote such awareness. Hi Suzy! I personally have never seen a black thimbleberry, although I suppose its possible for a random color variation to pop up. Did you get any pictures of it?